Well, hello! I thought I'd take a minute to show you the first computer project I'm going with my students this year. I teach K-6 computers and all the students in the school rotate to me over the course of 6 weeks. I emphasize keyboarding skills, but I love doing fun, technology based projects with my students! I always like to start the year off with a fun and easy get-to-know type project. This year, I came up with the Thought Bubble Introduction project. It's really pretty simple! Here in my cutie son, Camden, demonstating what the finished project will look like. - Inside the thought bubble they type out their introduction. I basically want students to type 5 or more sentences. They should start with their name, give a detail about themselves, and then list 3 things they like. Of course they are free to type whatever they want here, but some students get stuck so I like to have a certain format the students can follow if needed. -Using photo booth, each student needs to have their picture taken. My lab does not have built in web cameras, so I use my Hue HD Doc Camera and take and print them all for them just using the school printer. You could get fancy and use a digital camera dn send them to a printshop, but I am all about quick, easy, and inexpensive. One interesting note… I have to model for my students how to smile for a camera. I noticed with my first few classes that they would just give me a little half smile. Even if I told them to smile bigger, I would get the same little closed-mouth smile. So I started modeling how not to smile (closed-mouth) and how to smile big (wide eyes, showing teeth). It made a huge difference in the quality of their smiles! -Students take their bubbles and their pictures and cut out along the outside edge. Make sure when cutting out their pictures that they cut around their shoulders, hair, and ears! I've had kids cut of their ears or hair and it looks a little funny. Ha. Next, have them glue their cutouts to a colored piece of construction/cardstock paper. In our school we have divided into different houses (similar to how the Ron Clark Academy sorts their students into different houses) so I had my students choose their house color, but you could let them choose their favorite color, or you could assign a certain color. -Once all students have finished, I will hang ALL the student introduction pages in the hallway near the lunchroom. Students will love walking to lunch, seeing their own picture, and also "meeting" all the other students in the school! Our principal loves seeing student work hanging in the halls so I know she will love this project when it's all done. 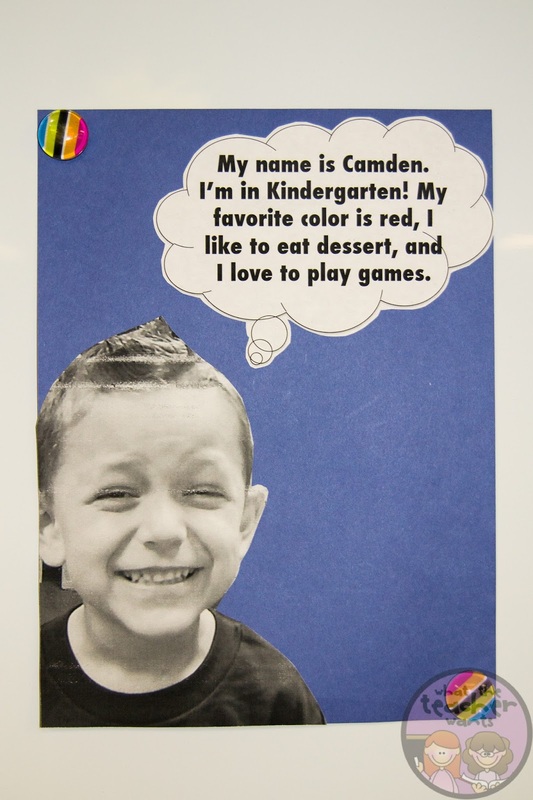 I also think parents will be excited to see their child's picture hanging on the walls when they come to parent teacher conferences next month. Overall, this is super fun and really easy project for students to do! Obviously, I have to differentiate this project for different grade levels. my 1st and 2nd grade students only type their sentences and they use their scissors to cut out their words in the shape of a bubble. My 6th graders love writing about themselves so they end up with really great, detailed paragraphs instead of just 5 sentences. I always encourage creativity so sometimes my older students will play around with formatting their shapes and words. It's fun to see how this one, simple project turns out so differently. I hope this will inspire some of you out there to do this project with your students or will spark ideas of similar projects you can do in the future. If you like this project idea, leave me comment and let me know what you think! I'd love to hear your ideas and feedback! GoNoodle's Back to School Blogger Blitz!